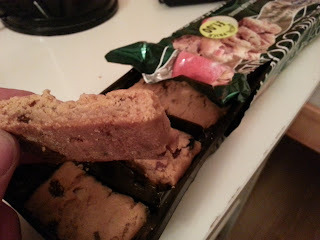 Pierate - Pie Reviews: Apple Pie Cookies - A new pie/cookie hybrid? 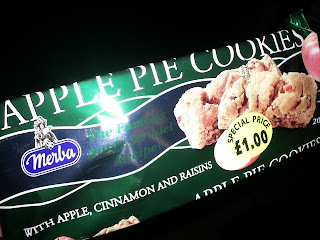 I saw these Apple Pie Cookies (image coming soon) for sale in a Nisa in King's Cross and couldn't resist trying them for Pierate - especially at the knock-down "special offer" price of £1.00. Anticipation was high. Are they cookies wrapped in pastry? Will I find a gooey apple pie filling hidden away beneath the cookie crust? Are they more cookie than pie? They're made with "the famous apple strudel recipe", with apple, cinnamon and raisins. Now, last time I checked, an apple strudel was NOT a pie. And a pie was NOT a cookie. So what am I to make of an apple pie cookie made with that "famous" apple strudel recipe? Well actually they're pretty tasty. They don't really taste like apple pie to me, but they're nice and cinnamony. Unfortunately they don't really represent anything to do with pies at all, given that there's no pastry involved. This is a bit disappointing, as I was drawn in with the hope of finding some exciting pie/cookie hybrid. Nice cookies, but not a pie.